Sconza is a family owned company with candy-making roots that date back to 1939. That's when creator and founder Vincenzo Sconza pioneered and pursused his candy-making dream. Since then it's been run, nurtured and grown by his family, and this year Sconza celebrates its 80th birthday! 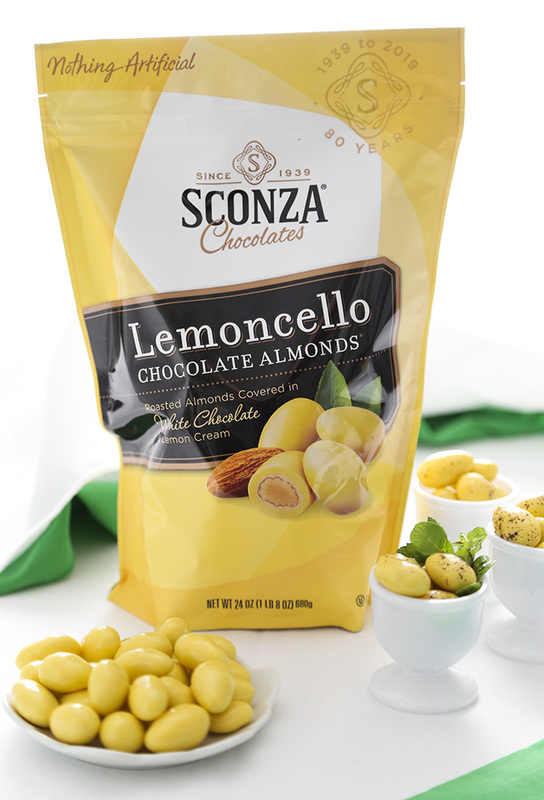 Sconza Lemoncello Chocolate Almonds will be available in Costco stores in the months of April and May, so be sure to look for them there! You can also order them online at this link. Sprinkle Bakes readers will receive a 10% discount at Sconza.com with the code sprinkle10. The candies have a creamy lemon flavor with perfectly crunchy almonds in their centers, so I knew they'd make a wonderful addition to this cake. I crushed about 2/3 cup in my electric mini chopper and added it to the cream cheese filling. I also had a bit of fun speckling the almond candies to look like little bird eggs. To do this you'll need a kitchen-dedicated stiff bristle art brush, and a little dark cocoa powder mixed with limoncello or another spirit such as vodka. It's just a matter of flicking some of the chocolate mixture over the eggs and then waiting a few minutes for the speckles to dry - so easy! 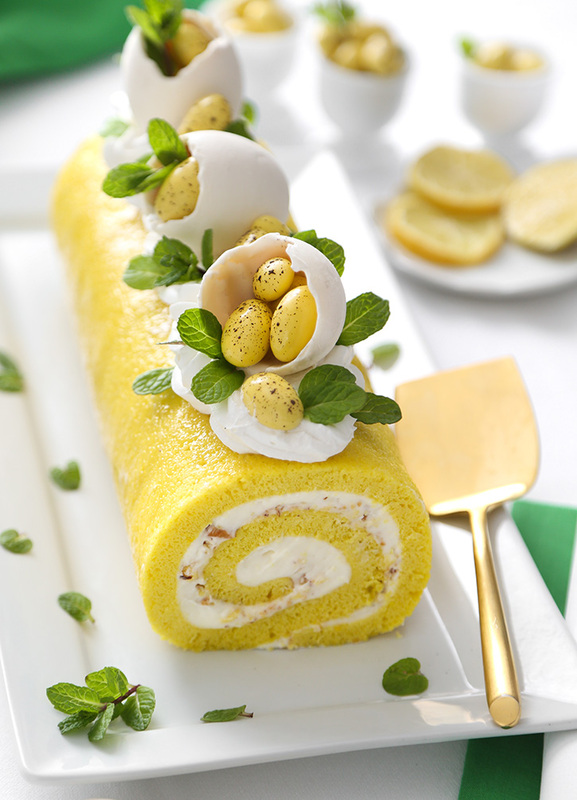 The rolled cake gets a generous brushing of limencello on its exterior, which makes it tangy with lemon and also dissolves any spots of powdered sugar that might remain on the cake. 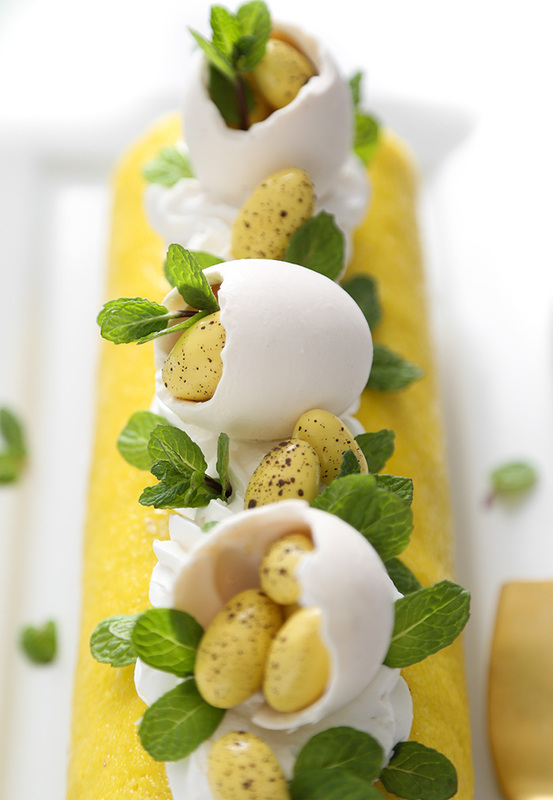 The limoncello-infused sponge gets an additional stripe of piped frosting on top. This stripe will serve as a way to hold some special decors on top! Eggs are a beloved Easter motif, so I decided to try my hand at making some cake decors using egg shells. Before using the shells for confectionery molds, remove the membranes by peeling them away with your fingers. Bake them at 200 degrees F for 20 minutes to sterilize them. After the eggs have cooled, pour melted candy inside the shells and turn to coat the inside. Turn the eggs upside down over the bowl of candy to pour away the excess. Chill the eggs until the candy is firm and then peel away the shell - voila! I filled the candy eggs with the speckled Sconza Lemoncello Chocolate Almonds and arranged them on top of the cake. My herb garden is just waking up with warmer spring temperatures, so I used some of its first baby mint leaves to finish the cake. The cake's flavors are altogether lovely. The almond-studded filling is creamy and contrasts the cake's tart flavor well. And the presentation is pretty cute for Easter if you opt for the playful candy eggs on top! Happy Spring! This original recipe and blog post is sponsored by Sconza Chocolates. I only recommend products and services that I've had the chance to use personally and feel will be beneficial to the readers of Sprinkle Bakes. Preheat oven to 350 degrees. Grease a 10x15 inch jelly-roll pan with white vegetable shortening and line with parchment paper. In the bowl of an electric mixer fitted with the whisk attachment, beat eggs for 5 minutes with a timer set. Properly whipped eggs will lighten in color considerably and have the appearance of yellow cake batter. With the mixer still running, slowly add sugar and oil to the whipped eggs. Next, add milk and lemon extract. Switch the whisk attachment for the paddle attachment. Sift together flour, baking powder and salt. Slowly add to the liquid ingredients. Mix until well combined. Mix in food coloring a little at a time until a bright yellow color is achieved. Pour batter into the prepared pan and tilt pan to distribute batter evenly. On a work surface, sprinkle a large cotton tea towel with the powdered sugar and rub sugar into the towel with your hands. Bake for 7-10 minutes. Cake is done when it springs back when pressed with fingers. Turn the cake onto the tea towel without delay. 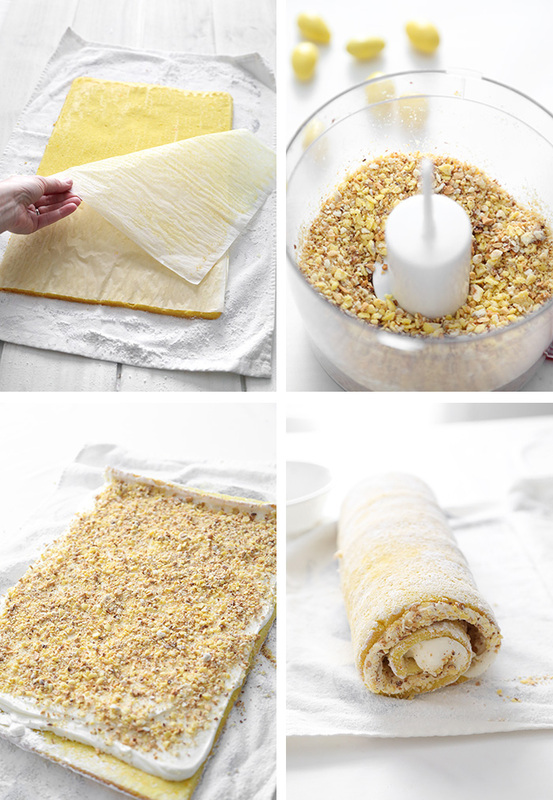 Peel off parchment and immediately roll cake into the tea towel, beginning at the narrow end. 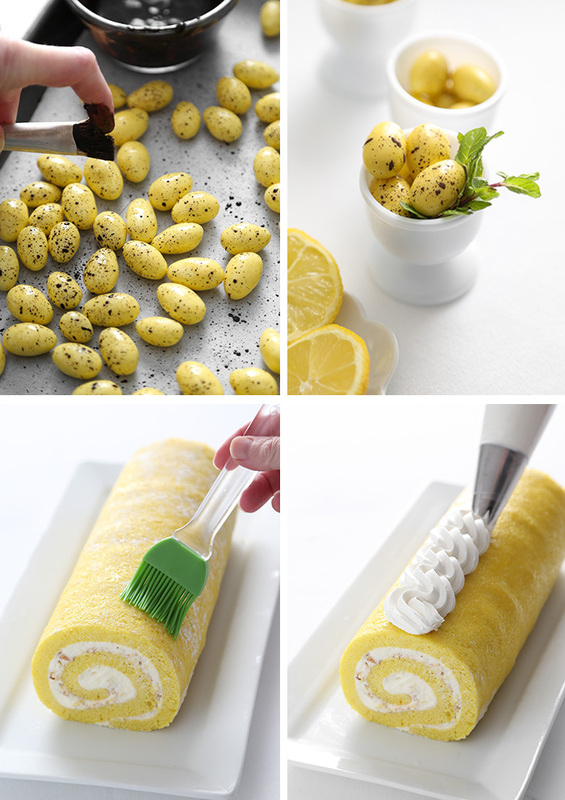 Roll tightly and as evenly as possible. Place rolled cake on a wire rack seam-side down and let cool completely. Meanwhile prepare the frosting. Make the frosting: Combine the cream cheese and butter in the bowl of an electric mixer fitted with the whip attachment. Add powdered sugar gradually. Add vanilla extract. Beat until a thick frosting forms. If the mixture looks lax, beat in more powdered sugar. Transfer 1/4 of the frosting to a piping bag fitted with a large French pastry tube. Set aside. Add the chopped Sconza Lemoncello Chocolate Almonds to the remaining frosting and fold gently. Unroll the cooled cake and cover with the frosting. Roll the cake up tightly, and then roll the cake into a sheet of plastic wrap; refrigerate until firm, about 1 hour. Meanwhile, make the speckled almonds and candy eggshells. Place the cocoa powder in a small condiment cup and mix with a little limoncello or vodka until a loose consistency paste is formed. Place the almonds in a deep baking pan. Dip a stiff bristle art brush in the chocolate mixture and pull back the bristles with a finger and release. Do this repeatedly until the almonds are speckled. Let stand until dry, about 15 minutes. Preheat the oven to 200°F. Place a cooling rack over a baking tray. Crack the eggs by tapping them with a spoon on the most pointed end. Once egg tip is cracked, pinch away just enough of the egg shell top for the egg white and yolk to pour out. Wash the shells in warm water. Rub your finger on the inside to remove any bits of the membrane. Place the cleaned egg shells onto the cooling rack and bake for 20-25 minutes. Let the sterilized egg shells cool completely. 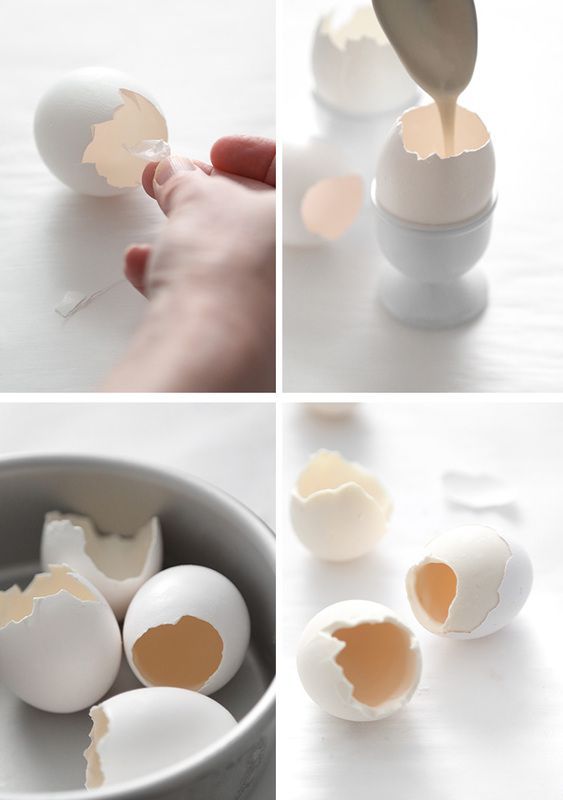 Lightly grease inside of egg shells with shortening using a finger. Combine the candy melts with the shortening in a microwave-safe bowl and heat at 30 second intervals in the microwave until melted and smooth. Pour melted candy into the egg shells and turn to coat. Pour excess candy out of the shells into the bowl. Place the shells on a baking sheet or in a cake pan and freeze until solid, about 10 minutes. When candy is set, peel away the egg shell to reveal the candy egg. Remove the chilled cake from the plastic wrap to a serving plate. Brush generously with the limoncello liqueur. Pipe a line of frosting down the top center of the cake. 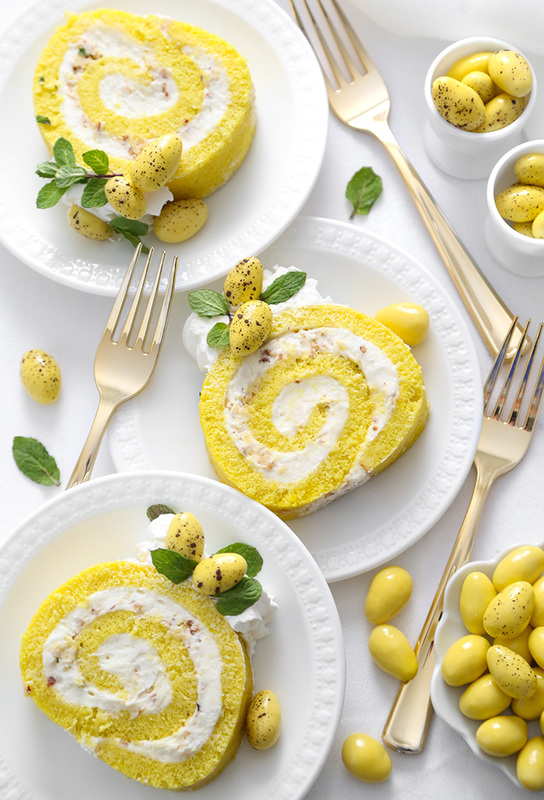 Place the speckled almonds in the candy egg shells and arrange on top of the frosting line on the cake. Arrange additional speckled almonds around the candy eggsshells. 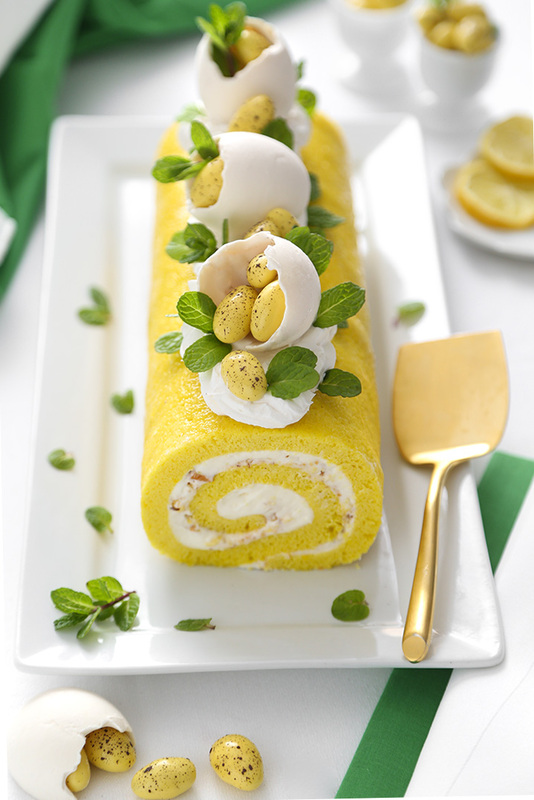 Add mint leaves and sprigs on top of the cake and inside the candy egg shells with the speckled almonds. Serve immediately. Store leftovers in the refrigerator under plastic wrap. Note: Mint leaves and sprigs will wilt over time. Add them to the cake just before serving. The decorations on this are just spectacular! I love the stuffed chocolate eggs. I have a huge bag of lemons on my counter right now, and will DEFINITELY be trying this one! Can you substitute lemon extract with lemon juice? I hardly use lemon extract for anything and wouldn't want to buy a whole bottle if I can use real lemons. Hi! You could, but I would suggest using 1 teaspoon of finely grated lemon zest instead of using juice in place of the extract. The oils in the rind will impart a stronger and more obvious lemon flavor, like lemon extract. My almonds arrived yesterday in time to make this for Easter! I opened a bag this morning, hope there are enough left by Sunday to make this...wow what a great treat! So glad to hear that! We've gone through an entire bag, just snacking on them!